Ron M. Walls, MD, Michael F. Murphy, MD and Robert C. Luten, MD with updates by Calvin Brown III, MD. An essential tool for clinicians who manage emergency airways in any setting: the ED, ICU, in-patient unit or the many EMS practice environments. 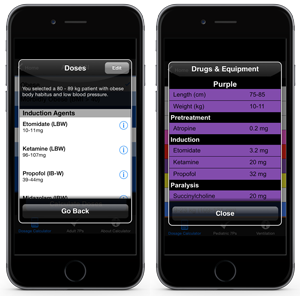 This app rapidly and easily selects the right drugs for RSI, automatically adjusting for body habitus and qualitative blood pressure as appropriate. Pediatric dosing and equipment selection is a snap using the Broselow-Luten color system or the child’s estimated weight. Keeps you on the right track! 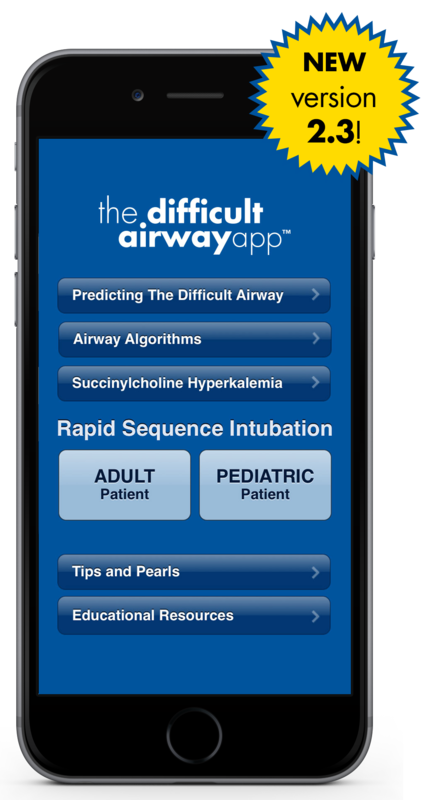 The Difficult Airway App™ guides the user quickly and easily through key algorithms, predictors of the difficult airway and the step-by-step approach to RSI taught in The Difficult Airway Course: Emergency™. If you have questions about this app, please visit our Contact Us page.